My first post after introducing this project and blog was about abandoned couches, so it seemed fitting to end the year with a photo of another one. (Which wasn’t difficult, by the way, because it is the end of another college semester at Cal).Walking Berkeley will be back again at the beginning of January. Hope the rest of your holiday season is enjoyable and involves some walking! Lots of excitement here over the past few days. First of all, the traffic light is now functioning at University Ave. end of the newly paved section of the Santa Fe Right-of-Way. I happened to be there during the morning commute and school drop-off time, when University (a major thoroughfare) was busy and it was raining a bit. I pushed the button, and sure enough the light turned and traffic stopped. I was anticipating some surprise due to the newness of the light and its placement between intersections, but no cars came skidding to a stop. 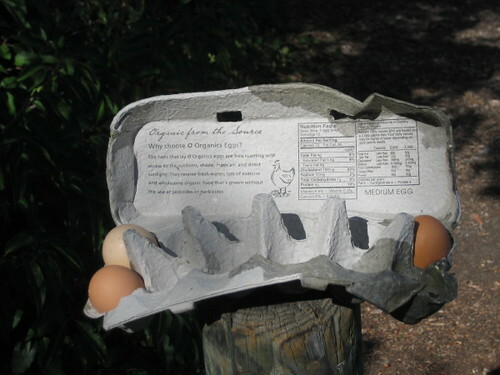 And if this wasn’t exciting enough, a few days ago I finally saw someone using the Parcourse along the Ohlone Greenway. I refrained from asking the man questions about whether this was a regular routine, how he dealt with the broken exercise stations, etc., because he looked intent on exercising. This reminded me that I had a couple of other things I wanted to point out recreation-wise in Berkeley. Recreation facilities in Berkeley include the typical soccer fields, basketball courts, baseball and softball diamonds, as well as skateboard parks, Frisbee golf, and a lawn bowling green. I have seen other lawn bowling greens in the Bay Area and elsewhere, but I particularly like the one in Berkeley. I was looking for a website for the lawn bowling club, which I did not find. However, I did turn up an interesting page on the club from an activist website. It seems that a bit of controversy surrounded the green in the 1970s regarding the use of some of the bowling green land for construction of a tot lot. Quite a few references were made to clashes between the rich “hill people” who used the greens and the lower and moderate income “flatlanders” in the neighborhood of the bowling green. I haven’t heard of any issues with the greens these days. A couple of months ago I was cutting through the old Berkeley Adult School campus and heard some music off in the distance. Turning the corner, I found a water aerobics class in session! It looked like a lot of fun, and I was all ready to sign up right there until I found out that it was for seniors only. 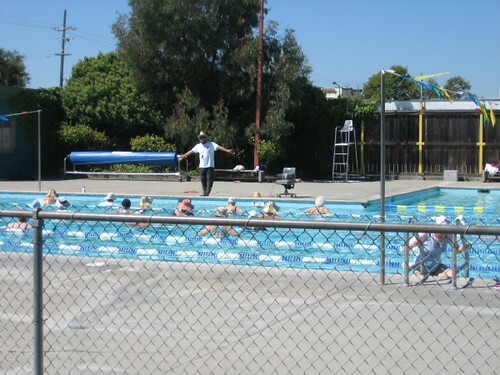 Berkeley has a few pools and aquatics programs, and offers lessons, lap swimming, and programs for disabled swimmers. And speaking of disabilities, I spent some time recently looking at Ann Sieck’s wonderful website for wheelchair accessible trails in the Bay Area. Her website includes listings for Berkeley, describing wheelchair accessibility at UC Botanical Garden, Cesar Chavez Park, and Tilden Park. A very useful resource! Artist Richard Long has created sculptures by walking in the landscape, walks as “textworks”, and other art resulting from walking. Janet Cardiff is know for her multisensory audio walks. In One Mile From Home, Julie from the UK has this challenge: “Walk a minimum of one mile from home. Record where you’ve been with a drawing, sculpture, photo or painting and then walk back. Every day for a year.” She posts the art on her blog, and includes links to others who she has inspired to take on similar challenges. The Los Angeles Urban Rangers have offered guided hikes in Los Angeles, including projects at the L.A. County Fair and on Hollywood Blvd. Also see my post about Kate Pocrass’ Mundane Journeys book and tours. When I finish walking every street in Berkeley, I am thinking about posting a list of the “best ofs” and “mosts” from my walk. As I have been looking at the Berkeley map, I am estimating at least a few more months of walking (expect more on this in an end-of-the-year wrap-up) before this happens. 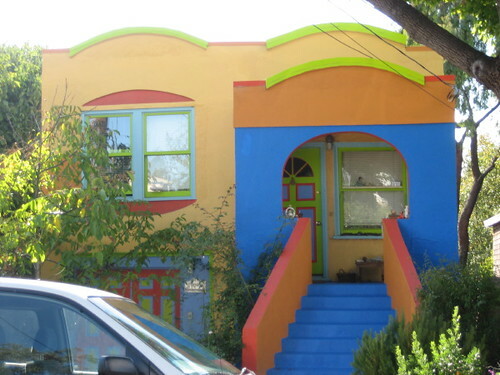 I do not want jump the gun by making any proclamations, but have found a very strong contender for the brightest and most unique house colors. Berkeley has some Victorians; not nearly as many as San Francisco, but even so I had expected to see many more unique “painted ladies.” It has more often been the Mediterranean-style homes where I have seen interesting paint schemes. Berkeley readers, feel free to suggest other contenders! Something else that has been on my mind along with the TV house that I talked about a few days ago is satellite TV dishes. As you know, I try very hard to notice everything around me while I am walking. I do not have to try very hard to notice these dishes. They are everywhere, from the most run-down of apartment buildings to pricey homes. Why is it that they stand out so much? The obvious response (other than the not-so-objective one of them not being particularly aesthetically pleasing) would be that they do not blend with the architecture of most homes. But one could say that they about many modern things that sit in front of houses — cars, plastic planter boxes and pots, many garden lights and ornaments. Really, I have not seen too many cases where everything one sees in front of a house is authentic to the house’s period. Probably it is also a case of the dishes being relatively new compared to the other things we are used to seeing on or next to houses. So if that is the case, will I eventually just get used to seeing those dishes and not notice them as much? I wonder if people had the same reaction to some of the monstrous TV antennas that were so common before the rise of cable TV. I do notice that there are still some of these antennas around, in some cases appearing to be in danger of blowing off the roof in a big storm. Despite the prominence of architectural heritage and preservation in Berkeley, there at the same time appears to still be an attitude of “be and let be” in terms of the appearance homes. Of course this is only gathered from my observations on walks, and I have no doubt that there are (as there are everywhere) people complaining about unsightly neighboring properties. 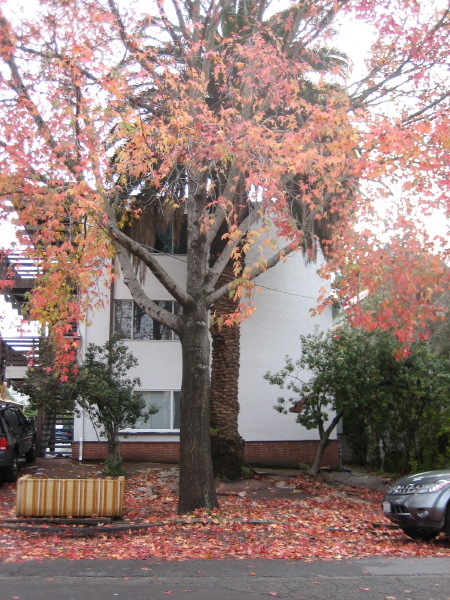 But so far I have not seen any cases where there appears to be rules about the appearance of properties — e.g., rules that say which trees and plants, house colors, decorations, etc. are acceptable — as one might find in communities where there are homeowners associations governing these sorts of things. Most publications that advocate regular walking mention benefits such as a healthy heart, improved mental health, decreased automobile use, etc. I definitely agree with these, but I would add that walking also has the potential to allow us to be more understanding and tolerant of each other. I don’t want to sound too idealistic (I’m not saying walking is going save the human race or anything), but I do find that walking and consciously observing has increased my ability to see that there is always more than one side to a situation. My judgmental response to the satellite dishes might have previously been: “Ugh, those things are so ugly, and why do so many people have them anyway; they are just wasting away their lives in front of the television.” But now instead I find myself having the observations and questions that I listed in this entry, and also thinking: “Those satellite dishes are not very pleasing to my eye, and I am certain that there are some homeowners who don’t like the look that this creates in their neighborhood. On the other hand, I appreciate the variety of things I get to see when I am out for a walk, and I am glad that people are not prohibited from having satellite TV or from expressing themselves by decorating the front of their house.” And so on.